This is an article I wrote back in November 2008, but as nothing seems to have changed, and in fact might even be accelerating with the rise of the Tea Party crowd, I think it worth dragging out of the archives for another look. Although the demographics of the typical Tea Party can be suburban, rather than rural, they display similar characteristics of “every man for himself” that is downright dangerous in our interconnected world. Easy answers to complex problems is their mantra. Don’t I wish that were true! With the election of Barack Obama, America selected not just a black President, but a visionary President with grand ideas for social reform and a better future. Although there was some crossing of party lines and a general acceptance by independents of the more progressive Democratic platform, rural whites held fast to their GOP loyalties and favored McCain-Palin with margins of 70-30 across the country, especially in the South and Midwest. A month before the election, I made a quick visit to my parents’ home on 200 acres of pristine Ozark woods, overlooking the man-made river-lake that rises and falls like an unpredictable ocean tide with the demands of the two hydro-electric dams that created it. In the Ozarks of my childhood, whites aligned themselves to the conservative Democratic Party and the few blacks who could vote did so for progressive Republicans. No southern white Democrats today in this staunchly and proudly Republican corner of the world. I’m told that, if there are any Obama supporters in the area, they would be found in Sedalia where the blacks and Mexicans live. I was confused by my relatives’ and their neighbors’ adamant opposition to what they sneeringly called “socialism.” Weren’t the older ones living on social security and taking full advantage of Medicare? Many locals have served in Iraq, mainly called up through the National Guard, a service they joined “part time” to receive government benefits. They hadn’t reckoned on actually going to war, but when it happened, they went and left small children and financially-struggling wives (and husbands) behind. Although they display proudly the American flag and staunchly defend the war, they quietly, and their mothers openly, count the days until their commitments are over – and pray fervently that they won’t be called to serve again. They worry sick about getting sick and medical costs. Few aspire to more than a high school diploma because of the prohibitive costs of community college. Quality childcare for the working parent is not part of their lexicon. The only support system is family. They work low-paying jobs, and spend evening and weekends doing odd jobs, second jobs or truck-framing to survive. Living far from services such as grocery stores, doctors and work, a gas increase of $0.50/gallon can wreck havoc with the family budget. They drive 50 miles one way in their gas-guzzling trucks to shop at Walmart to make their pennies stretch. I was puzzled by their adoration of Sarah Palin and their belief that a socialist Obama heralds the death of America. 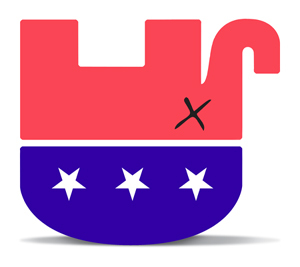 Convinced that the Republican Party is the only true representative of God and country, they fear the very changes in society that could vastly benefit them and ease their daily, anxious struggle to eke out a life for themselves and their children. Why do rural whites vote to protect the wealth of the upper-class Republican? How is the GOP underclass persuaded by appeal to patriotism, racial pride and religious belief to vote against their own self-interest? Fiercely independent (how else could you live so far from every convenience? ), their non-conformity does not extend to criticizing or questioning country and flag when there is war or perceived threat. “My country right or wrong, my country.” But when you have sacrificed time, suffering, blood and even life to the battle your country called you to, it is not easy to entertain the idea that it could all have been for naught. Who wants to admit that their son or daughter is just canon fodder for the paranoid ambitions of Republican powers in Washington – Republicans that they have so faithfully supported? It seems strangely medieval that a political philosophy could be so entangled with religious dogma that the interpretation of words in a book compiled millennia ago would dictate politics and social mores in 2008. It defies logic to allow the belief that a soul enters the egg at fertilization, or marriage may only be between man and woman, to condemn you to a life of anxiety and economic struggle. It’s quite incomprehensible that a religious and political belief would idealize living at the mercy of fate and bad luck, with no safety net to catch the precipitous fall of your family when your strength fails. But so it is for those 70-30 supporters of the Republican agenda. 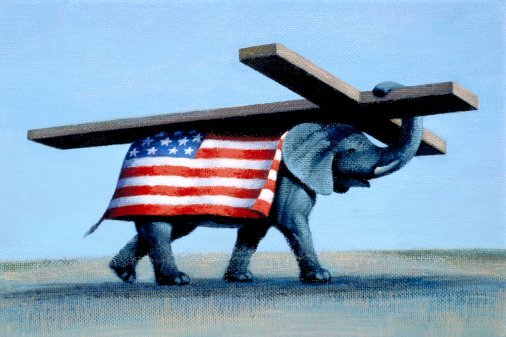 Yet the Republican Party, even enjoying tremendous backing from strongholds like the Ozarks, will not survive as a political party based on religion, no matter how it tries to wrap itself in the flag and dress up its message in the American spirit of individualism and work ethic. The question is whether the rural white GOP will continue to oppose social reform once its benefits are made available to them. Barack Obama’s message spoke to the millions of Americans who sense that the American Dream could be better, must be improved upon, and that the promise of everlasting life in an unproven paradise is not adequate compensation for the fall from paradise Americans are experiencing today. If President Obama succeeds in moving this nation into a new era, he might just convince everyone who needs help, including some of those who need it most – the Republican underclass. Excellent article! I hope the tides will rise in that Ozark lake. But good news! Republican Senator Lindsey Graham now warns that his party cannot generate enough angry under-informed white males to carry the elections anymore. “Weâ€™re not generating enough angry white guys to stay in business for the long term.â€ They may have to go after blacks, hispanics and women voters to win this one – a little late! What I’m worried about is the voter suppression, Tea Party skinhead pollwatchers, and flat-out vote theft. The hatred in your language is so indicative of the direction of the GOP. You provide the perfect example. Pathology yes. The adoration of blatant lies is definitely sick. But the choice to support positions that are in direct conflict with your interests is the sickest of all. Sadly, your analysis still holds. There’s something pathologic in the disconnect between fact and the fake Republican narrative. It sadly impacts really hard on those least able to deal with its destruction. But, in this country, we get the government we deserve and if we feel we don’t deserve anything but crumbs, then that’s what we’ll get. Wow, to call the idiot child a visionary after all he has done to screw this country, his party, his voters, etc demonstrates you live in a dream world. I knew he still had some support, as shown by his 40% approval rating, but few of them would have written the lips on his sack crap you just wrote. Enjoy while you can, we will soon rid this country through the voting booth your messiah and his groupies. Now go eat some raw chicken, lose your keys, and destroy your phone(s) and do the rest of normal America the best favor you could ever do for us!